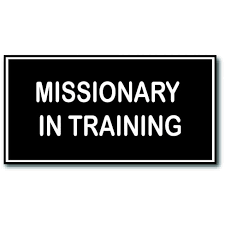 In previous blogs I have talked of the Missionary in Training program. It might be of interest to some to know how this program came into being. A journal entry from March 6, 2013 talks of the beginning of the program – along with some insights about developing talents through the power of the Holy Ghost. On that date, I walked from my place of employment to a nearby Deseret Book store – with the plan to buy some “Future Missionary” badges for some grandchildren. On that occasion, the inspiration through the Holy Ghost started to come. And as it did, I recorded enough notes -and some verses – to be able to tap into the Spirit at a later time to receive the full message. I love the Parable of the Talents! I am sure that you recall this. Most folks, when they hear this story, think that it is about putting money in the bank and getting interest – though financial success can be a part of it. In the day of Christ, “Talents” were/was actually money. But I love to think of it literally about talents – like writing, song composing, playing a musical instrument, singing, art, taking tests, sports, etc. The same process applies to teaching a lesson or making a presentation. The Lord gives each of us talents or gifts (like Gifts of the Spirit). And he gives us opportunity to learn and to develop these talents for the building up of his kingdom and to share with others. That is the key! Some of our talents are given to us because of circumstance or need – and we get them and hardly recognize them as talents of the Lord. When I was a sixteen, my current Bishop came to me and asked if I would work for him in his flower shop. I did so. When i started there, I knew nothing about floral design. But, I took advantages of opportunities to learn to create. And over time, and with a lot of practice, I became a skilled creator and designer of flowers – for wedding bouquets, funeral arrangements, corsages and flowers for all occasion. I have enjoyed this talent through the years. Another scenario. 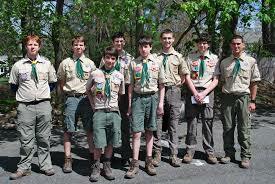 When I was a Scout, our Scoutmaster – Mr. Nelson – taught all of us Scouts how to cook in Dutch ovens. I continued to develop this talent on my own. Then, over time, and through a lot of practice, I became a rather skilled Dutch oven chef. And I have very much enjoyed sharing this with family and friends. 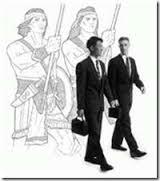 Genealogy and family history research is another example. When I was twelve, I had opportunity to take a genealogy course that lasted just a couple of months. But, I caught the spirit and with time and a lot of practice, I can now skillfully accomplish research for my and for others. This has been a great blessing to many people. I could go on and on … the Lord has been good to me. Other talents I have asked for and have worked to develop them after being given the talents. In the Parable of the Talents, it says, “And unto one he gave five talents, to another two and to another one EVERY MAN ACCORDING TO HIS SEVERAL ABILITY.” Then he that RECEIVED the five talents went and made them other five talents. And son on with the one who HAD RECEIVED two talents. And then there is the case of the guy who had one talent given to him (without him doing anything for it) his his away. Even though given of the Lord, he did nothing with it. He did not share it with others. Then at his coming, the Lord gave the man with five double – and so with the one with two. But the one that was given one and did nothing with it, his was taken away and given – as a bonus – to the man who had five. The five and two had learned how to magnify their talents and used them to serve others – rather than keeping them to themselves. Over time, and through practice, I have come to realize that all talents are given to us through the Holy Ghost. Not too many people have come to this realization. Once I came to realize this, some glorious things happened in my life. The Lord wants us to have and use many talents. And as we learn and receive talents by the Holy Ghost and serve others with them, He will magnify them and give us more and more. It is a pretty exciting concept. he process is pretty simple: Pray for help. But, don’t pray in generalities. Get real specific. Say, “Heavenly Father, I am anxious to write a poem about ….. I pray specifically for the Holy Ghost to inspire my thoughts on this subject and give me guidance and direction.” Then go to work to learn the skill, learn the lesson, study, perfect, etc. Then after your own extensive preparation, talk again with the Lord. Thank him and the Holy Ghost for his guidance and help on this ……. poem (ow whatever). Pray for added help as you perform or do or write – or speak – or whatever it is. Then do the act … teach the lesson, perform the talent. And be in tune to the Spirit. Act upon what you studied and the inspiration gained. And at the end, pray again in Thanksgiving for the guidance and direction received. Recognize the Holy Ghost as the source of the talent, ability or knowledge. We are always told that we are to teach “by the Spirit”. But no one tells us THE HOW of such a task. it is always in generalities. When I was on my mission, it was the same. We were always told to “teach by the Spirit”. We were told that time and time again. It was years later – through time and a lot of practice that the HOW came to me. And when it hit me, it was glorious indeed. Fabulous! Words do not describe the feelings, the results and the exhilaration of having the Spirit with me. The results were phenomenal! My capabilities were magnified. And I was working on the errand of the Lord – not on Kevin Hunt steam. Of course to have the Spirit – and to develop talents and teach by the Spirit, one has to do the basics: Keep the commandments, read the scriptures, say regular prayers. And if doing these things, then the Spirit is able to dwell with you. Then with the Spirit, you can take His help and guidance to the next level by asking for specific help. It is all kind of exciting! So, what does this have to do with missionary work and mission preparation? I believe that it is incumbent upon all of us to develop and use our talents so that we can be prepared to serve as the Lord needs us. And as we learn to teach by the Spirit, we become servants of the Lord and can become effective teachers. And in so doing, we can realize that we are on the Lord’s errand and that it is actually the Holy Ghost who is doing the teaching. A beautiful and wonderful concept for missionary success.